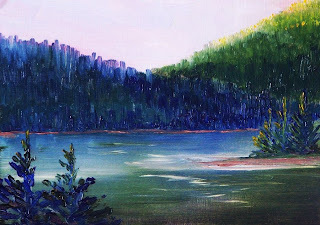 This is my last posting for 2007, and although I usually paint in oils, this is an 8 x 10 acrylic painting. I haven't painted with acrylics for a very long time, so it was quite an adventure. 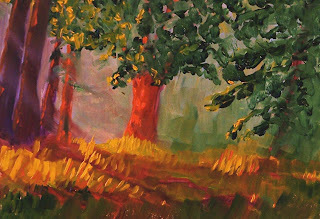 Acrylics dry fast, so I painted fast which resulted in a very painterly style. I'm dreaming about the beach. I love spending time on the Pacific Coast--walking, taking it easy, and flying kites. There are kite festivals in the spring and summer all up and down the coast--Long Beach, Westport, and Ocean Shores. They all partake in sponsoring kite festivals. 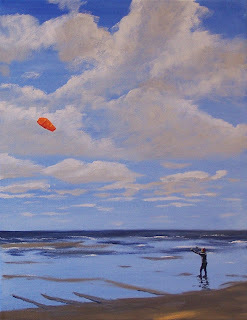 This 11 x 14 oil painting on stretched canvas is my contribution to the sport of kite flying. Today my imagination takes me back to a late summer evening. 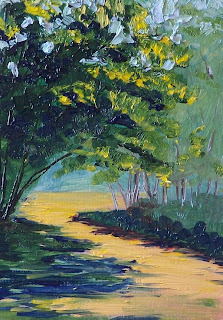 This 5 x 7 oil painting on gessoed hardboard reflects the atmosphere of long shadows and brilliant contrasts. This painting has SOLD. 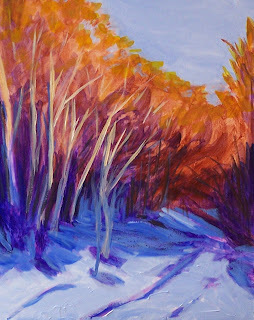 Record snow is falling in the mountains and it makes me want to paint a snow scene. 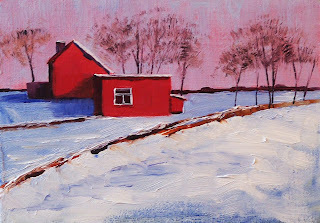 This little 5 x 7 oil painting on gessoed hardboard is inspired by snowfall on a little red farmhouse. I'm glad to be in a warm house and painting little scenes like this one rather than trudging through the cold. This painting has been SOLD. 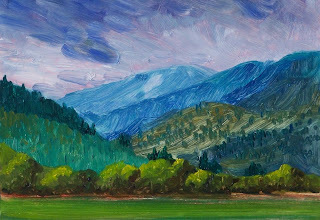 A storm brewing over the Nisqually Delta prompted original 5 x 7 inch oil painting. 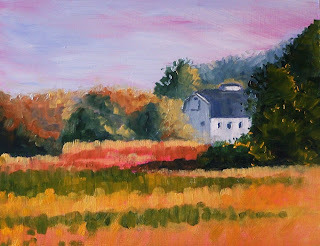 I prefer warm colors, so even though a cold rain was likely to hit, I painted it with a warm palette. 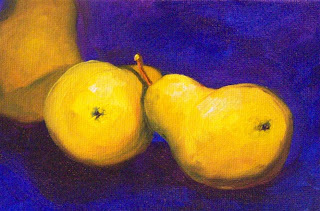 This painting is SOLD. 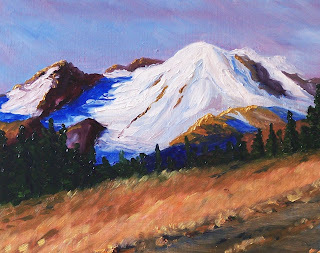 After yesterday's look at the mountains in winter, I had to think about the mountains in spring. Green grass, warm sunshine, and fresh air. I'm looking forward to the season. 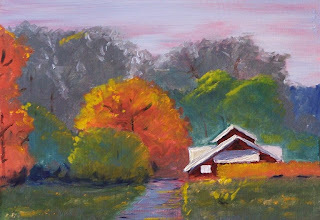 This 5 x 7 inch miniture oil painting was painted on gessoed hardboard. The Cascade Mountains are covered in snow now, but it was just a few weeks ago that a glimpse toward the foothills provided a scene like this one. 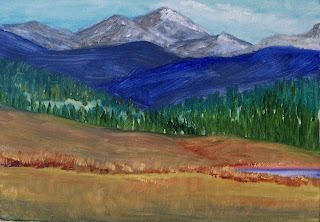 The fields of the lowlands are brown, frost etches its way into the treeline, and the hills get ready for a wintery coat. 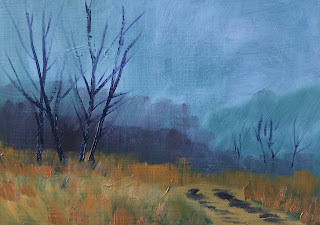 This 5 x 7 miniature oil painting conveys the feel of the cold, dampness just before the snows fall. 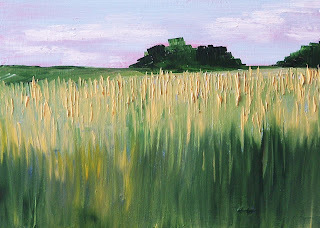 An Eastern Washington field of grain was the inspiration for this little 5 x 7 oil painting. 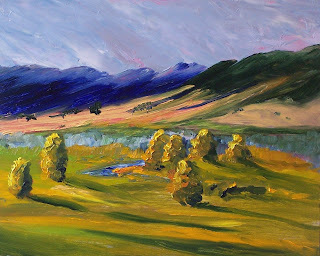 The wide open spaces and warmth of the landscape are a delight in the spring and summer. Memories of warm weather are a comfortable change from the drab cold of winter dampness most of the northern states are experiencing. This painting is SOLD. 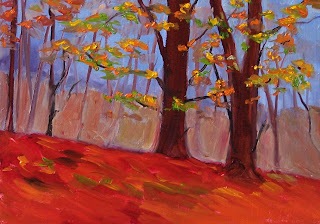 An afternoon walk through the trees of fall inspired this 5 x 7 inch oil painting on gessoed hardboard. Leaves on the ground created a carpet of red as the bare limbs of winter began to show. This painting has been SOLD. 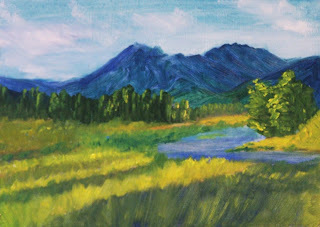 This was a fun little landscape painting to create. 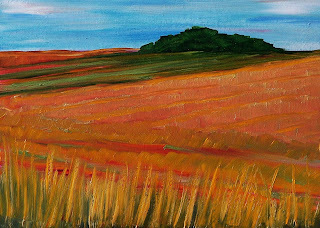 I used the inspiration of the wheatfields of Eastern Washington as the inspiration for this 5 x 7 oil painting on gessoed hardboard. The area around the Palouse provides acres of rolling fields that take on a delightful green in the spring and warm gold in the fall. I'm still longing for summer. Floods, snowstorms--the glut of bad weather keeps me looking forward to warmer weather. 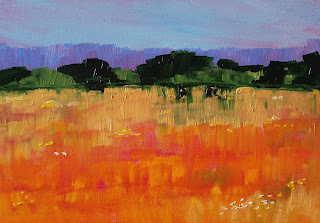 When I painted this sunny little 5 x 7 abstract oil painting this morning, I imagined basking in a summer field with sunshine, warmth, and wildflowers. This painting has been SOLD. 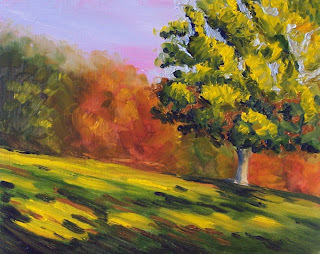 The cold weather and the rain is not very productive for cheerful thoughts, so I took my imagination and my paints and created this sunny light 5 x 7 oil painting. 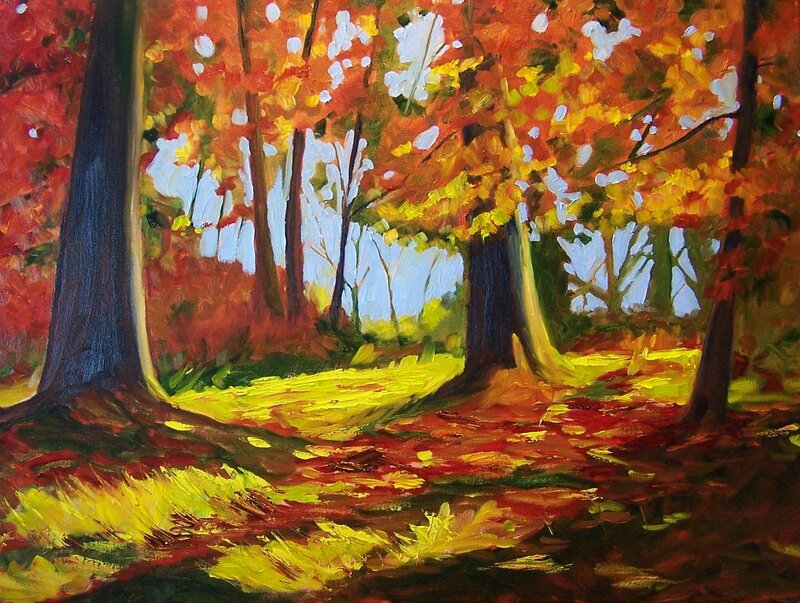 I imagined warm sunshine sifting through the trees, gently touching the floor of a warm little forest clearing. It is only a short time until the days start getting longer. I'm looking forward to spring. In the mountains it is snowing which means it is pouring rain on the coast. Living in Washington State, it is a treat to know that within a couple of hours I can be either in the mountains or on the Pacific Coast. 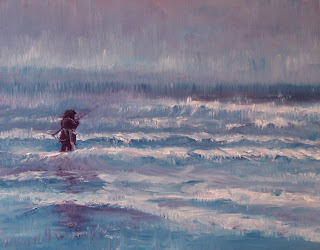 This 8 x 10 oil painting on gessoed hardboard is reminiscent of cold, wet days on the coast where hearty fishermen practice their skill even on the wettest of days. The ski slopes are opening for business. Last week's storm provided more than enough of the white stuff for the most of the ski resorts to open. 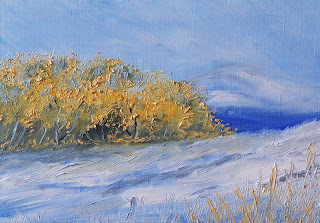 This little miniature 5 x 7 oil painting is inspired by an early snow. The leaves are faded, but have not fallen. Straw pokes through in places. It won't be long until all the leaves are gone and the straw is completely buried. With winter in full swing, I want to think of warmth and springtime. 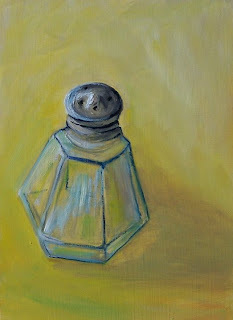 This little 5 x 7 oil painting was created with these ideas in mind. I love the smell of fresh blooming lavender. It is a joyous reminder of that special time in spring when blooms begin to appear. 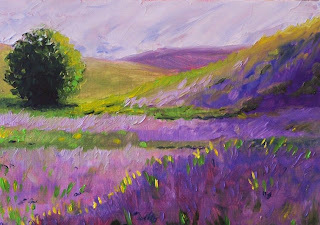 This miniature painting of lavender fields was created on ¼-inch gessoed hardboard with professional grade oil paints. 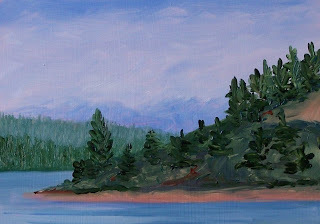 It will fit easily into a standard sized frame or can be displayed on a small table-top easel. It can be purchased at ETSY this month for $35.00 plus $6.50 for shipping to US addresses. Click here to purchase it. 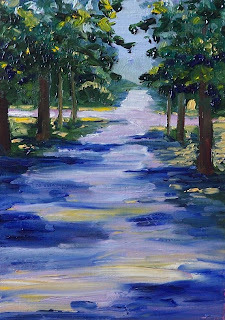 You can see more of my Small Impressions paintings for sale by clicking here. The Pacific Northwest has just emerged from a vicious storm. The flooding has been devastating. Much of Western Washington is submurged and a massive effort is underway to rescue people from their flooded homes. I feel very fortunate that my home and family survived without damage. While the storm waged its war, I tried to think of sunshine and summer evenings. 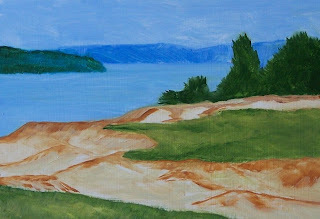 As the wind whipped through the area and the rain poured down, I painted theis little 5 x 7 landscape painting. I had no idea of the results from the nasty interval. I'm glad I was able to create a little diversion for myself. My heart goes out to all who were not as lucky and I wish them the best in their recovery efforts. If you click on any of the links in this posting, you can see some photos of the horrible effects of this storm. 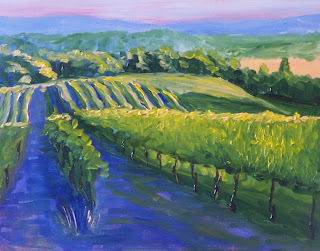 Today I am violating my policy of sharing only my small works in this blog because I had so much pleasure in creating this 18 x 24 landscape oil painting. Yesterday I stumbled across the web site of Canadian artist, Brian Simons. 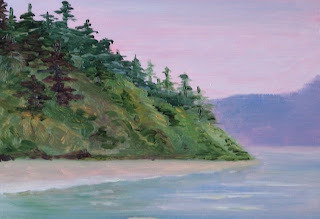 He creates beautiful representational paintings of a variety of subjects. 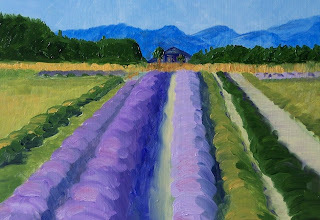 His work is colorful and painterly. 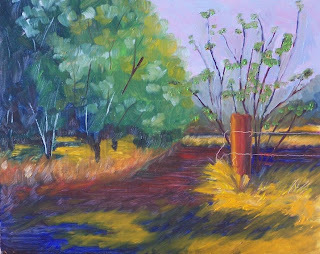 He also offers workshops and has written a book, Seven Steps to a Successful Painting. Although I had never purchased a downloadable book before, I took my chances and purchased the condesnced e-book edition. His instruction is clear, concise, and directed toward beginners. 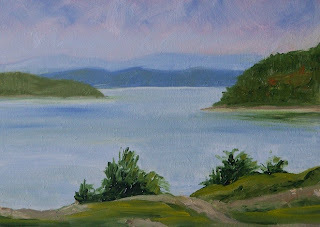 His instructions are for those interested in learning about acrylic painting, but the concepts are easily applied to oils as you can see by the results of my painting. 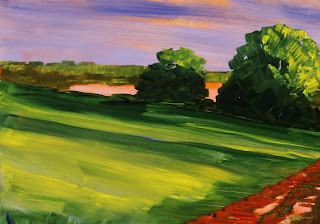 The most exciting part of the book for me is that he recommends starting with a canvas that is at least 24 x 30, only a few brushes, and a limited palette. If you have been considering picking up a paintbrush, I'd certainly recommend looking into the instruction Brian offers. Saturday morning is grocery time at my house. It often means I get some exciting new subjects for my art. 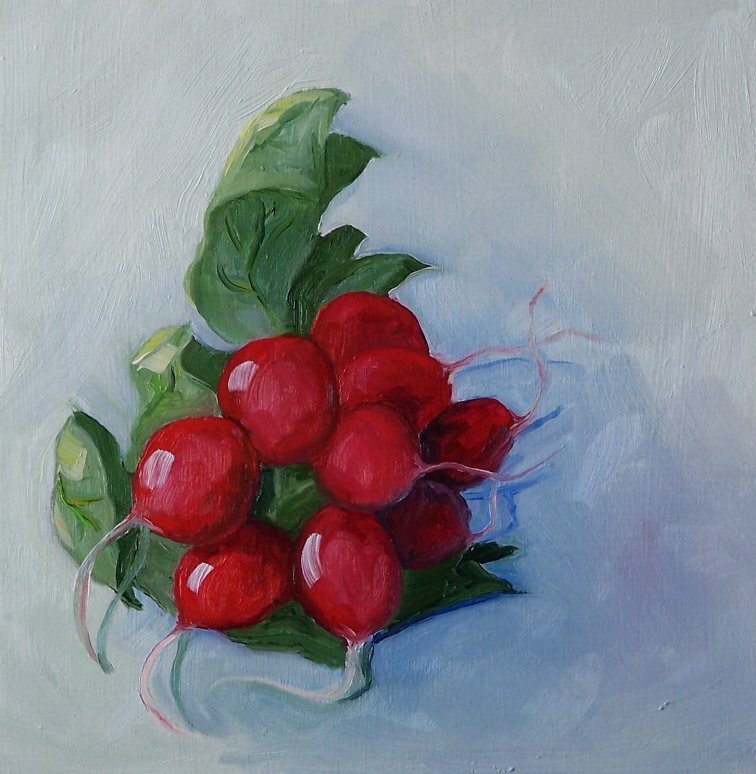 This little oil painting on hardboard panel is approximately 8 x 8 and is the result of a Saturday grocery trip. I love the brilliant red of fresh radishes and the contrasting green of their leaves. I think the grocer bunched them just for me. This little painting has been SOLD. 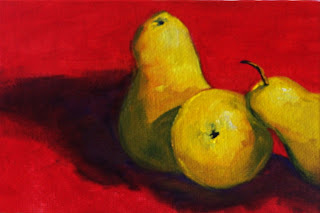 I love the contrast these three little yellow pears create as they sit patiently in front of a red background. 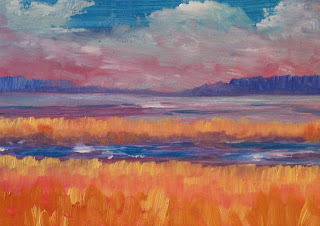 Painting this miniature 3 x 5 oil painting on canvas panel was an interesting challenge. 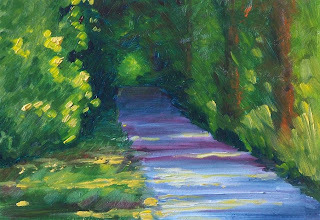 I don't usually paint on grounds quite this small. I was amazed at how quickly I was able to complete the painting. 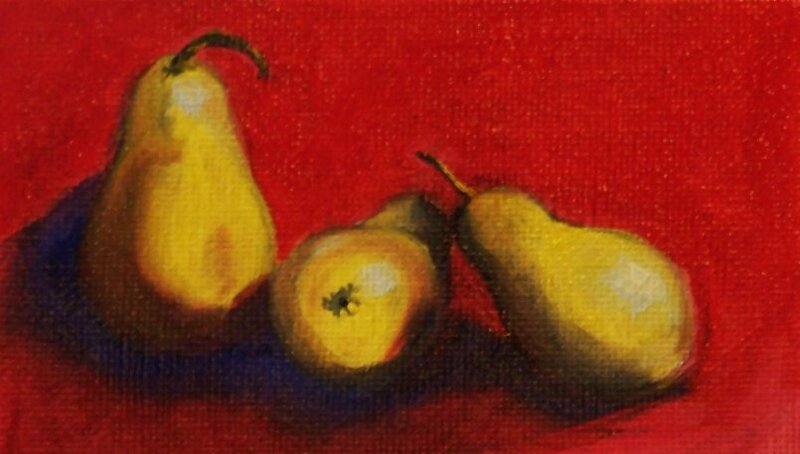 The warm yellow and red are a delightful relief on these cold winter days. The painting has been SOLD.